While it would be easy to think I simply offer writing and editing services, that’s just half the story. With decades of language and marketing expertise, my real job is to improve sales for business clients, get more buy-in for government clients and boost support from donors or members for non-profit clients. How? With written content that is crisp, clear and, most of all, compelling. As well as writing that persuades and inspires, I offer No-Surprise Pricing (yes, it’s a thing) and a No-Risk Guarantee (so is this). Not happy? You don’t pay. From my approach to marketing to the work I carry out in the community, this passion is reflected in everything I do. And I am just as passionate about my clients. I ask myself constantly: what additional value can I deliver to ensure the client comes back? Here are the benefits I offer to make sure they do. No-Risk Guarantee Not happy? You don’t pay. It’s as simple as that. 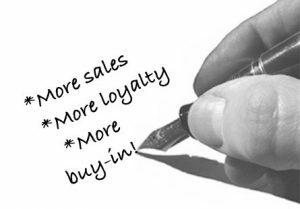 Loyalty I help you build trust with your customers. both increasing their loyalty and boosting your revenues. Everybody wins. Expertise Due to my broad range of knowledge, I have the ability to climb the learning curve quickly and confidently. Experience I have written and edited virtually every type of communications and marketing vehicle imaginable from websites, news releases and annual reports to brochures, government reports and video scripts. Highly experienced, I can deliver what you need, when you need it. No-Surprise Pricing Each quote includes a final price so you know, in advance, exactly what you will get and at what cost. There are no surprises. Ever. Plain language Fluffy, jargon-filled words and phrases leave people confused and unsure. Plain language is language that is understood. Availability I will always be available when you need me. That means when you are working, so am I. Simplicity I reject the idea that marketing and the content that drives it has to be complex. I believe practical people making practical, common-sense decisions can have a huge impact on a market. Capacity Because I have a team of associates I trust, I have the talent to meet the most excruciating deadlines. We can get it done—now. If you need content that is clear, concise and, most of all, compelling, contact me today at ron@ronjette.com or at 613-850-5554 (talk or text) and I’ll make it happen.